(Stoneham) There is nowhere to hide with a new musical. Unlike a fresh drama, where an audience can be tricked into going along if there’s enough shouting, as soon as an actor opens her mouth to start singing, the audience can tell whether the song enhances or detracts from the plot, usually with disastrous results. myself laughing more often than scratching my head. Saturday morning shows after eating two bowls of Choco-sugar bombs. 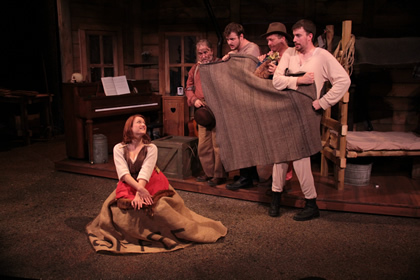 This entry was posted in Comedy, Musicals and Opera and tagged 2012, Bill Gardiner, Comedy, Darcie Champagne, Fred Alley, Harry McEnerny, James Kaplan, Lumberjacks in Love, Mark Linehan, musical, September, Steven Barkhimer, Stoneham, Stoneham Theatre, Vanessa J. Schukis by craigidlebrook. Bookmark the permalink.